Good comment. I really like KWin as well, but for perhaps other reasons than you. I don't care about compositing, wobbling and other effects. In fact, disabling all of them is the first thing I do. Heck, I don't even display contents of moving windows. I like KWin because it's so intuitively productive. It is smart on its own, but also lets me manipulate windows fast and easily, by keyboard or by mouse. It is also very configurable when I need that. I'm excited to hear of improvements in 4.7, and I'm very glad this fundamental component of the desktop is not only not neglected, but actively focused on. Thanks, KDE developers! I'd be a lot happier with 4.7 if kmail2 worked. So far its been unable to migrate my kmail1 emails. I've been using kde since 1999/2000 and have a large collection of emails to migrate. kmigrate gave up after creating my folders. attempting to import the folders manually causes linux 3.0 to oom... I have yet to find a good migration guide and IMHO its badly needed. I migrated via evolution. Evolution was happy to migrate my emails from kmail1 and kmail2 was happy to migrate my emails from evoltion. I never tried the kmail1 -> kmail2 migration so don't know how bad it is. I only confide in packagers which will keep to distribute the great KMail 1. I cheered when 4.7 was released and posted on Facebook as well as Google+ ... a bit too early apparently. Digikam has new features, that's great. KMail has new features, that's great too. However, there's something severely wrong. I have never had such serious problems with SuSE/KDE before - they're serious enough that I will be considering leaving the platform, but I hope I can figure it out so it won't have to come to that. I can't create a new person tag in Digikam from an address book entry. Don't ask me why, I haven't the faintest idea. Could be because no people are showing up in my address book. I have no idea where all my contacts are now, but the address books that worked fine before the upgrade are still appearing in KAddressBook - there's just no people in them now. KMail is simply crashing every time after filtering messages and complaining about duplicates (conflicting updates). So I can't access my old e-mail and I can only read and send e-mail using browser-based interfaces or my Android-based telephone (which doesn't have all my accounts defined). Apparently there is no plan to fix this in an urgent update to 4.7.0 - all the suckers such as myself will just have to learn our lessons and not upgrade any important system in the future - unless we have *a lot of* time to spare. Seems the KDE team has learnt one trick too many from the Microsoft people; ship it with known errors, no matter how serious. The recommendation may be to perform a clean install and import all the data and settings afterwards, and perhaps everything would have worked then - but without a proper tool to migrate settings from a previous version installed (or from a backup of such an install) - how many people are willing to perform clean installs every time? I'm trying to use the computer for work - not just as a toy to waste time on. We have an iMac in the household - I've cursed it for being unflexible and not very co-operative in a mixed environment. Perhaps I'm going to end up there, just like my neighbour who used to have Linux but said he switched to MacOS because he got tired of having to tinker. If they told you that bug was fixed in 4.7.1, then that's it, it's fixed. You'll have the bug fixed in the very next upgrade, next month, and it will be better tested. I'd be happy that it was found and fixed already. If you have very sensitive information in a production machine, you should be very careful with upgrades, on _any_ system. That's why 4.7.1, 4.7.2, etc. are there, IMO. Haven't you heard? OSX users have plenty of problems on upgrades, too. Can't say I have heard about an upgrade of MacOS (or Windows) that makes the e-mail completely unusable. I'm sure it is correct that this has been fixed in the 4.7.1 branch - but leaving it at that just isn't good enough in my opinion. Then again, I'm not a KDE hacker myself so I can unfortunately not contribute to help the situation. Guess it will be webmail for me the next month and hoping that the 4.7.1 update fixes it. If it's tagged as fixed in 4.7.1 then that's the KDE release it will be fixed in. Distros may pick up the patch before then, it may help opening a bug on your distro to request this. Not to put too fine a point on it, if you're not happy with things breaking on a .0 release then don't install a .0 release, wait for the .2. or .3 bugfix release. Unfortunately we don't have the resources to exhaustively test every possible combination, we don't have the budget or time of a Microsoft or Apple or even a Canonical, we're just a bunch of volunteers and have to accept that we will always ship with some bugs. We try hard to make sure nothing too serious gets out, but we often don't experience the bugs that our users find and have to rely on them to help, it's just part of the process of making open source software. In fact, this seems a perfect example, .0 release went out, user finds problem and files bug, bug gets fixed for next release. Sure, it's not ideal, but for me it beats the alternative. Well I guess he was confused by the title of the release announcement, promising better stability? Why do you promise this then? BTW, better stability as compared to what? KDE 4.6.5? Or kde 4.6? Or gnome perhaps? If you make a bold statement like that, people expect you to make good on that promise. That's normal. 12000 bug reports closed, 2000 specific bugs in the released software resolved since 4.6 - the reference was also in relation to the semantic desktop where a lot of long-term issues have been resolved. how many of those were originally filed against KDE < 4, and simply closed as "wontfix - obsoleted version"? of all those bugs, only 7 were from versions prior to 4. 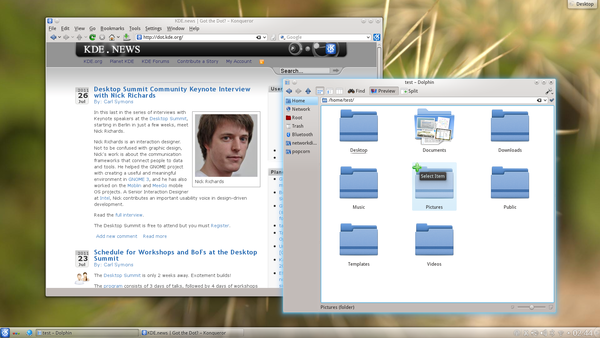 There was one from KDE 2 that got fixed with a change to the basic I/O routines and 6 exclusively from KDE 3. These mostly had to do with incompatibility with the old version of Q.T. so it wouldn't do much good to fix them now. Did the bugs you filed get fixed? Stuart: good work with the bug fixing. I still wait for full funcionality of Kontact. Lack in it, capabilities of simple integrations with Google.Simple system of backup. Try akonadi-googledata-resource. A bit basic, but works for syncing calender and contacts. I compiled it from git, see if there's distro support for your system. I just installed 4.7 from the kubuntu PPA. It is amazingly fast! Ok i admit, at the same time i also activated the software rasterizer for Qt, but man is that system fast now. PS: didn't install the new PIM yet. Hope its as great as the rest as kde 4.7.
my Kubuntu upgrade went with one small hitch...Smooth Tasks broke, and the maintainer isn't around. Oh well. Against my better judgment, I installed the new PIM. It works really well. I am surprised at what an improvement KMail 2 is over 1. It wouldn't even start when I first upgraded (by the way, there are warnings all over the place that this is _experimental_). I'm not the owner of my own inbox? Ridiculous. After much forum-ing and other exploring, I discovered in "Akonadi Configuration" (typing in start menu find box) that the place I stuck Mail was not where it was expected. Modifying that to its actual location made KM2 run. Then I had to check out the rest of the resources. Calendar was funky, cuz there are now several choices for resources to display. Pretty easy to sort out once I had discovered Akonadi Configuration. Just cuz I don't know better, I went to the Akonadi Server Configuration tab and restarted the server after the modifications. I've been using KMail for a long time. KMail 2 has dramatic improvements. And Plasma 4.7...wonderful. No issues (well I miss the Smooth Tasks eye candy). Just fast and solid feel. Activities...after the first load, switching is fast, everything solid. By the way, none of these issues were resolved by complaining at dot.kde.org. kde-look.org gave the clues about the status of Smooth Tasks and the forums (special thanks to Ben Cooksley, again) pointed the way to Akonadi and proper file locations. Installed 4.7, and yet again the desktops effects are broken again. Opening a bug report doesn't help, as nobody looks at them. Yes they do, even if we don't always write back on them. If you don't open a bug report you should have absolutely no expectation for it to get fixed.